Technics' limited edition SL-1200GAE turntable officially sold out | What Hi-Fi? With the final limited-edition SL-1200GAE now successfully shipped, we can expect the standard edition to follow later in the year. 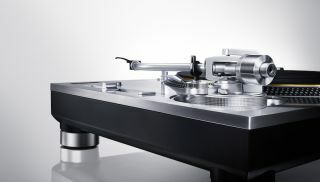 Technics has announced on its Facebook page that the final SL-1200GAE turntable has been shipped. The limited edition turntable was released in the UK in June for £2799, and with only 1200 available worldwide, it's perhaps no surprise that they should all be sold in just over a month - despite the high price. The SL-1200GAE proved predictably popular. 300 units were made available in Japan in April, and within half an hour every one had been sold - an average of ten selling every sixty seconds. The standard Technics SL-1200G is due on sale later in the year. It will be available in greater numbers and will have a few minor changes to its design. The price of the standard model is yet to be announced, but we expect that it won't be vastly different to the cost of the limited edition deck.